Our 'Grab a Grand' Cash Grabber game for hire has been upgraded for 2017 to the fantastic game pictured above. Instead of the inflatable version we had before we've upgraded it to rather smart looking aluminium frame and perspex version complete with a new high visibility timer display so spectators can see the time ticking down. 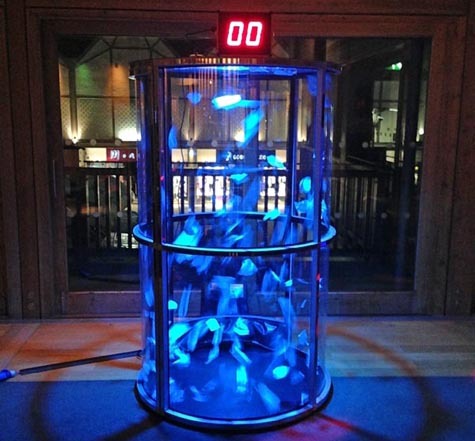 The Cash Grabber is a great game for promotional events, exhibitions, conferences, or just to hold your own game show. It can be used with play money, vouchers, and this new version can even circulate special coloured balls. The Cash Grabber requires an overall operating area of 6x6ft and a height clearance of 8ft if indoors. Access to a mains electric supply is required within 50metres. The game is normally supplied with a uniformed member of staff to supervise but unsupervised hire may be available for some events so please ask. 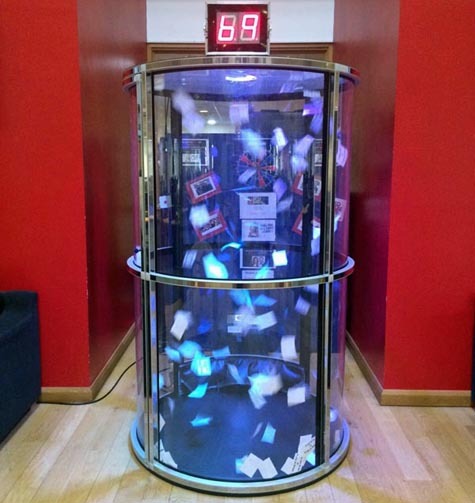 If you have any queries, questions, or would like to hire our Cash Grabber game for your event please call us on the number below or click to enquire and we will do all we can to help.